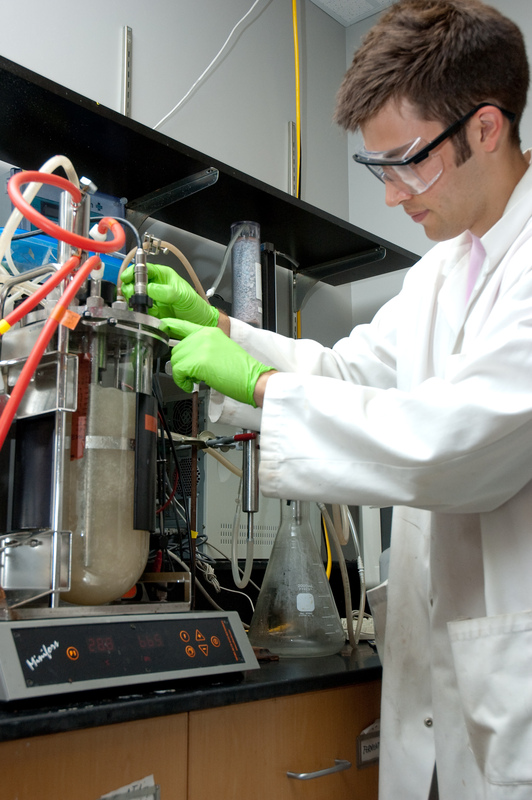 The Chemical Engineering Analytical Facility (ChEAF) was established with financial support from the Canadian Foundation for Innovation and the Ontario Innovation Trust. State-of-the-art instrumentation is used by graduate students and researchers to provide the fundamental insight into the molecular and bulk physical properties of polymers needed to design novel materials and optimize their properties. Spectrophotometers, particle size analyzers, and equipment to characterize the molecular size and structure of polymers. Our facility is equipped with a Thermo Scientific Evolution 300 UV-Vis spectrometer (4629) with Peltier temperature control, and a PTI QM-2000-7 rapid temperature control spectrofluorometer (4631) to study bioactivity of compounds. For particle size analysis, our versatile Zetasizer Nano ZS (4640) can handle particle size range from 0.3 nm to 10 µm. Particles with an expected diameter of 1 µm up to 2 mm are measured using laser diffraction by either a Beckman Coulter LS 13320 (4644) particle sizer or a Mastersizer 2000 (4637). The comprehensive collection of instruments for characterization of molecular size and structure of polymers provides optimal coverage on topics within the field. The Varian CP-3800 GC (4633) is used to understand fundamental kinetics related to free radical polymerization. For latex, suspension and polymeric solution, the Brookfield viscometer (4636) and TensioCAD surface tensiometer (4632) provide essential property measurement. Molecular weight distribution and conformation characterization is our forte, because we are able to perform triple detection GPC using our collection of four GPC units running a variety of common organic and aqueous mobile phase: Waters 2695 GPC (4634) with Wyatt EOS DAWN MALLS (low to mid-range, THF), Viscotek GPCMax (4642) with 270 detector array (mid-range to high molecular weight, THF), Agilent Infinity 1260 (4638) with MDS (Aqueous), Viscotek GPCMax (4643) with 302 detector array (DMF). The addition of Optilab RX (4639) to our GPC collection ensures that we can make reliable differential refractive index measurement in-house without resorting to other sources. Characterization of the mechanical properties (tensile, flexural and impact) of polymers according to industry standards. The facility is able to carry out ASTM standardized tensile and three-point bending flexural test using our Instron universal tester (4624) (5 kN load cell), as well as pendulum impact test using the BLI impact tester (4625). Equipment to characterize the thermal and rheological properties of polymers. The combination of TA TGA Q500 (4628) and TA DSC Q100 (3557) within our facility is ideal for the study of transformations within materials, including but not limited to polymers, when temperature is varied. The APA 2000 (4627) is unique in its ability of monitoring variation of rheological properties as a function of time under rapid temperature change and high strain rate. It’s indispensable for the study of curing kinetics as well as polymeric melt modification. Polymer processing and molding equipment. Our pilot scale compounding line centered on a state of the art Coperion ZSK 18 ML twin screw extruder (5110), equipped with a pelletizer. This setup is ideal for testing high value-added additives for formulations. Batch size as small as 200 g can be prepared. A Carver press is right by the compounding line, affording us the fastest processing time for resins from raw to finished standardized testing samples. ChEAF also performs characterization on solid material with large specific surface area and/or high porosity. Micromeritics ASAP 2010 (4635) and Quantachrome Autosorb-1C (5117) are both used to measure surface area and pore size distribution of particles by physisorption, while the latter is able to perform chemisorption analysis. Quantachrome Poremaster (5118) offers another approach to particle surface area and porosity analysis through mercury porosimetery.